Our Brazilian enforcer Fabinho has divulged the reasons why he settled on switch to Anfield from AS Monaco in the summer just days after the Champions League final. As part of Sky Sport’s pre-match build-up, the 25-year-old revealed that Roberto Firmino was a huge pull factor and was massively helpful in getting Fabinho to adapt to life in Liverpool. “Before coming here, I’d spoken to him about what it’s like at the club and what the city is like as well as the good areas to live in. 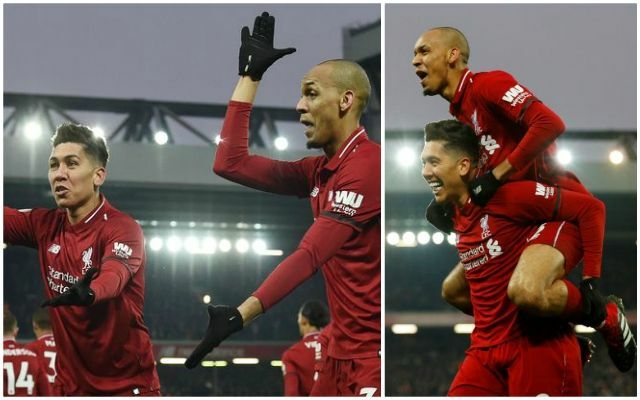 As we thought, it’s thanks to his fellow Brazil international that Fabinho is with us at Anfield; perhaps their friendship has been crucial in the form the midfielder has shown of late. Equally, the arrival of another Brazilian in Alisson Becker must have been another big boost for both Fabinho and Bobby. Having arrived for £44m in July, Fabinho had a slow start to his Liverpool career – he was made to wait until late-October to make his first start in the league having debuted in the dying embers of our win against PSG in September. On Jürgen Klopp, the Brazilian explained that the boss sets very high standards for him and his teammates: “He’s a coach who demands a lot and is very close to his players’, Fabinho admitted. “I think that both the coach and the coaching staff try to get the best out of the players. Fabinho has now made 28 appearances for Liverpool since his arrival – despite being on the bench for the Bayern Munich game he quickly replaced the injured Jordan Henderson and helped the team to a famous victory at the Allianz. He was then restored to the starting line-up against Fulham as we eventually secured yet another win to rise back up to the top of the league. He’s been in fine form for us and has now established himself as one of the first names on the team sheet.